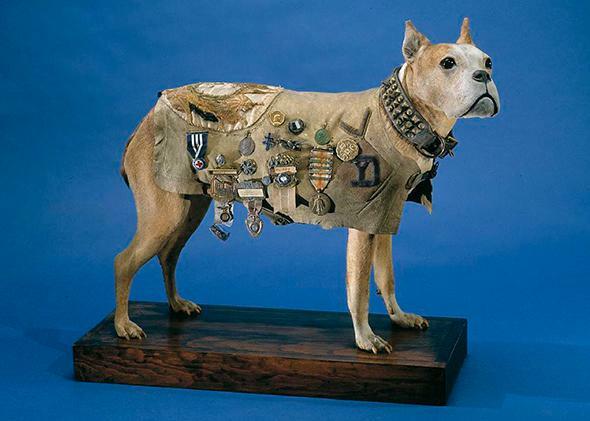 Dogs of war: Sergeant Stubby, the U.S. Army’s original and still most highly decorated canine soldier. America’s original dog of war fought bravely on the Western Front—then helped the nation forget the Great War’s terrible human toll. On July 6, 1921, a curious gathering took place at the State, War, and Navy Building on Pennsylvania Avenue in Washington. The occasion was a ceremony honoring veterans of the 102nd Infantry of the American Expeditionary Forces’ 26th “Yankee” Division, who had seen action in France during the Great War. The hall was packed with dozens of members of the 102nd—field clerks, infantrymen, generals—but one soldier in particular commanded the spotlight. The attention seemed to bother him; the New York Times reported that the soldier was “a trifle gun shy, and showed some symptoms of nervous excitement.” When photographers snapped his picture, he flinched. The ceremony was presided over by Gen. John J. Pershing, commander of the American forces in Europe during the war. Pershing made a short speech, noting the soldier’s “heroism of highest caliber” and “bravery under fire.” The general solemnly lifted an engraved solid gold medal from its case and pinned it to the hero’s uniform. 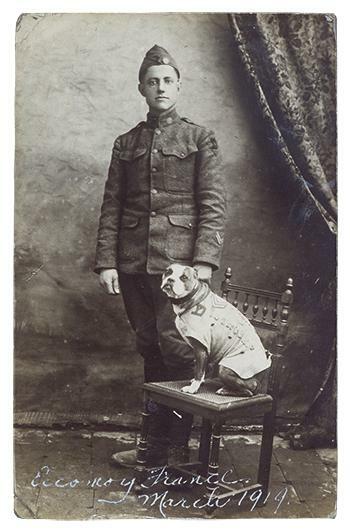 In response, the Times reported, the solider “licked his chops and wagged his diminutive tail.” Sergeant Stubby, a short brindle bull terrier mutt, was officially a decorated hero of World War I. The award was not a formal U.S. military commendation, but it symbolically confirmed Stubby, who’d also earned one wound stripe and three service stripes, as the greatest war dog in the nation’s history. According to the Smithsonian National Museum of American History, he was the first dog ever given rank in the U.S. Army. His glory was even hailed in France, which also presented him with a medal. Millions of Americans heard tales of Stubby’s courage. He had reportedly comforted wounded warriors on bullet-strafed battlefields. It was said he could sniff out poison gas, barking warnings to doughboys in the trenches. He even captured a German soldier. These exploits made the dog nothing less than a celebrity. He met three sitting presidents, traveled the nation to veterans’ commemorations, and performed in vaudeville shows, earning $62.50 for three days of theatrical appearances, more than twice the weekly salary of the average American. 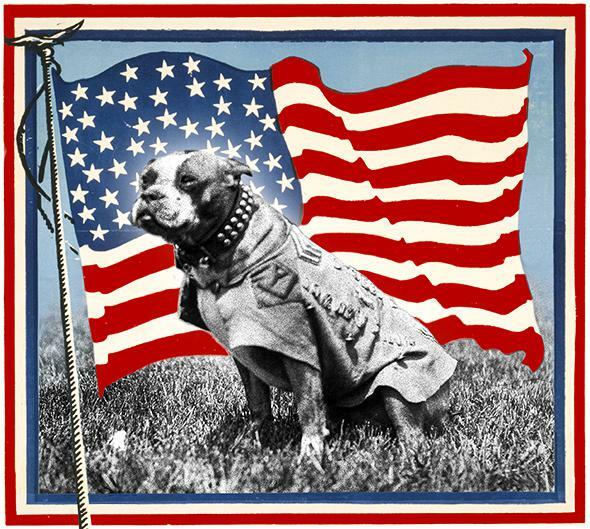 For nearly a decade after the war until his death in 1926, Stubby was the most famous animal in the United States. Sergeant Stubby among his buddies leading a Legion parade. “Stubby’s history overseas,” a Waterbury, Connecticut, newspaper wrote in 1922, “is the story of almost any average doughboy.” But of course Stubby was not a doughboy, and his renown was anything but average. Despite his postwar stardom, Stubby has faded from memory in the century since the war commenced. But his story is worth revisiting, and not just as a cute, curious footnote. Stubby’s tale offers a glimpse of the American Army as it prepared to fight its first modern war—and later, of a bruised nation as it commemorated a victory obtained at unthinkable human costs. Stubby’s provenance is unknown. According to several news reports, he first enters the historical record in July 1917 as an ownerless stray. The journey to the theater of war has the quality of legend—a scruffy, peculiarly American brand of myth. Stubby was like a character out of Horatio Alger, or a sentimental one-reel silent movie: an orphan who made his way in the world with perseverance and pluck. The setting for Stubby’s debut was the Yale Bowl in New Haven, Connecticut. Yale University’s football stadium was the site of Camp Yale, where the soldiers of the 102nd Infantry, part of the New England–based 26th “Yankee” Division, were doing basic training prior to their deployment. In September 1917, a few months after Stubby first embedded with the troops at the Yale Bowl, the 102nd prepared to ship out. Conroy faced a problem: What to do about the dog he had adopted and named Stubby? Dogs were forbidden in the U.S. military, but Conroy had managed to keep the stray as a pet throughout his three-month training in Connecticut. Getting Stubby to Europe would be a more daunting challenge. The troops traveled by rail to Newport News, Virginia, a newly designated port of embarkation for soldiers heading to France. Here the 26th Division was slated to board one of the largest freighters navigating the Atlantic, the SS Minnesota. The New York Times describes how Conroy eluded the ship guards by concealing Stubby in his Army-issue greatcoat. He then spirited the dog down to the hold and hid him in the ship’s coal bin. At some point during the turbulent Atlantic crossing, Stubby was found out. 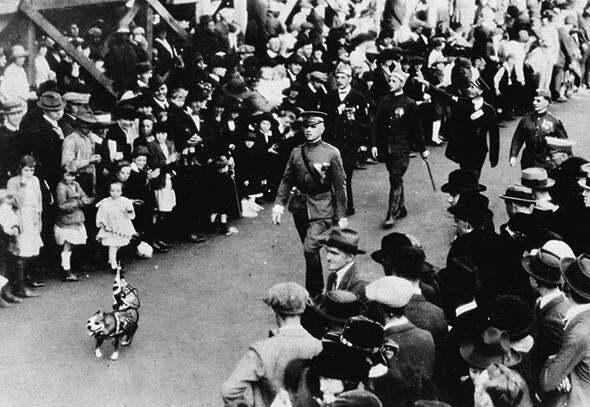 Here the lore of Stubby, as reported by various newspapers, takes on a suspiciously cutesy cast: The story goes that the dog charmed his way into the good graces of the officers who discovered him by lifting his right paw in a salute. Out of hiding and free to roam the freighter, Stubby proved popular with the crew. A machinist onboard fashioned Stubby his own set of metal “dog tags.” By the time the troops disembarked in the port of Saint-Nazaire on France’s western coast, Stubby was the 102nd Infantry’s unofficial mascot. The Royal lion hunt reliefs from the Assyrian palace at Nineveh, about 645-635 B.C., housed at the British Museum. The story of dogs in warfare is an old one, stretching back to antiquity. 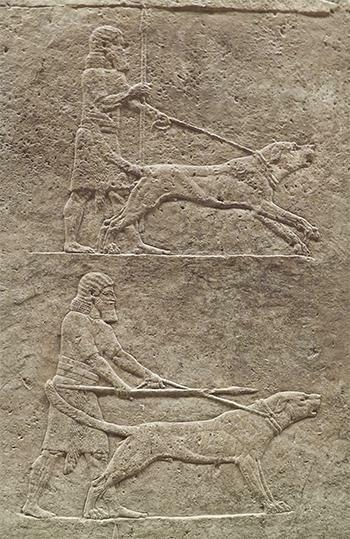 Persians, Greeks, Assyrians, and Babylonians all used dogs in battle. Dogs were part of Attila the Hun’s forces in his fifth-century European conquests. In the Middle Ages, knights outfitted dogs with canine armor; Napoleon used trained dogs as sentinels in the French campaign in Egypt. Many of the countries involved in World War I had war dog training schools in place prior to the conflict. France, Britain, Belgium, Germany, and Russia all recognized the value of trained dogs on the battlefield. The conventional wisdom favored pedigreed dogs: Jack Russell terriers for chasing rats out of trenches; German shepherds, Chiens de Brie, and Alsatian sheep dogs for sentry duty. Airedale terriers were considered good messenger dogs. Siberian huskies, naturally, were relied on for transport. Dogs were also a key part of the Red Cross’ aid efforts, and every country had its own unit. Red Cross dogs, also called sanitary dogs or Sanitätshunde by the Germans, negotiated battlefields and no-man’s lands to aide wounded men. Saddlebags stocked with water and medical supplies were strapped to their backs. Because they wore the Red Cross symbol, these dogs were, in theory, protected from being shot by the enemy. Often, the dogs simply provided comfort and a warm body to dying men on battlefields. Baldy of Nome, famed Alaskan sled dog, and his owner Allan “Scotty” Allan. 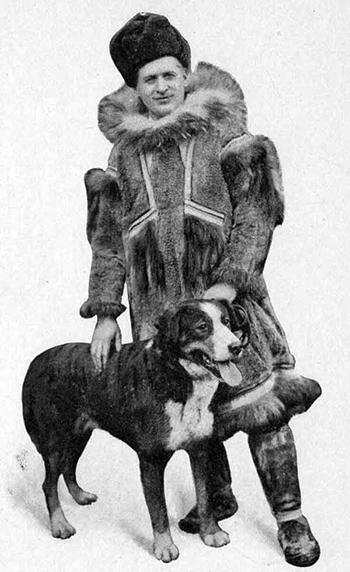 Baldy sired 28 of the sled dogs sent to France by Allan during WWI. Germany had a long tradition of military dogs and had the war’s best-trained canine force. In the 1870s, the German military began coordinating with local dog clubs, training and breeding dogs for combat. They established the first military dog school in 1884, and by the start of the Great War, they had almost 7,000 trained dogs. At the peak of the war, Germany’s dog forces numbered more than 30,000: messengers, Sanitätshunde, draught animals, guards. Among the allies, France had the largest and most diverse dog units. At one point, the U.S. Army borrowed French-trained dogs for sentry duty, but the plan was eventually aborted because the dogs only responded to commands in French. At the start of the war, the United States was one of the few participants in World War I that did not maintain a canine force. 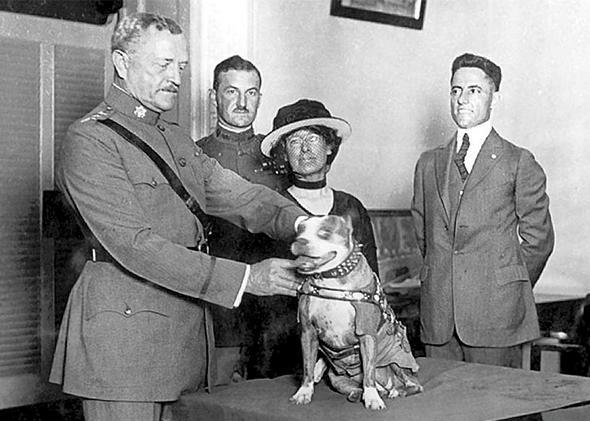 Gen. John Pershing awards Sergeant Stubby with a medal in 1921. War dogs weren’t the only area in which the U.S. military was wanting. The Army lagged behind its allies in both recruiting and preparedness. “We came into this war without an army … so now must build an entire new organization,” said Gen. Pershing in 1917. Stubby, the foundling mutt, was thus an apt mascot for the U.S. forces: unpedigreed, untrained, an underdog. French soldiers in trench in Northeastern France, circa 1916-1918. 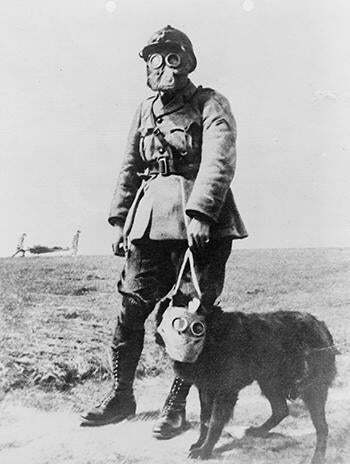 A French sergeant and a dog, both wearing gas masks, on their way to the front line. 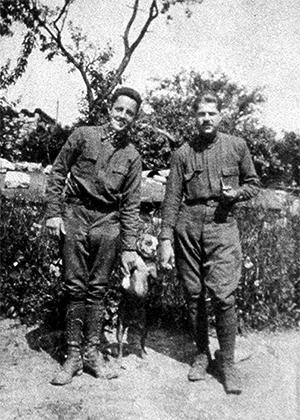 It was at Chemin des Dames that Stubby reportedly saved the 102nd from a gas attack. The Times describes how one morning, while most of the troops were sleeping, the division was assaulted by an early morning gas launch. Stubby first smelled the gas then ran up and down the trenches barking and biting soldiers, working to rouse them from slumber and getting them to safety. On April 5 Stubby became a private first class, his first military rank. 18th Infrantry, Machine Gun Battalion passing through Saint-Baussant, France, in advance upon Saint-Mihiel front, Sept. 13, 1918. The 26th Division soon moved from Chemin des Dames to nearby towns of Saint-Mihiel and Seicheprey. 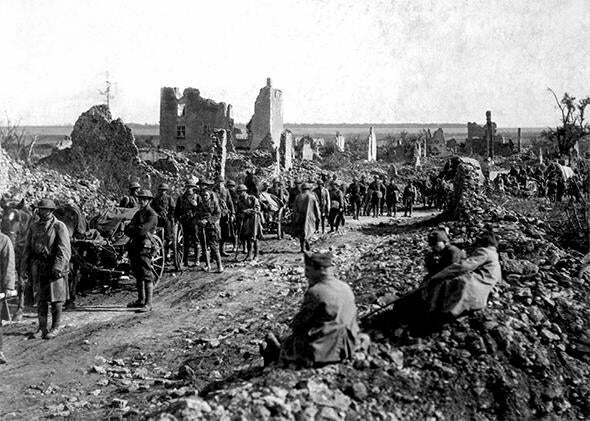 The 102nd Infantry headquarters were set up near a dangerous spot 1½ miles north of Mandres-aux-Quatre-Tours. Known as “Dead Man’s Curve” because the hazardous turn required oncoming vehicles to slow down, the location made easy prey for the German artillery. Stubby and company were placed in support positions to wait for a German breakthrough. On April 20, near Seicheprey, the Germany infantry led one of its first attacks against American troops. Almost 3,000 German Stoßtruppen (shock troops) fired on, and overwhelmed, a small contingent of 600 American soldiers from the 26th. Fighting was so intense that Maj. George Rau, commander of the 102nd, ordered his cooks, truck drivers, and even the marching band into the fray. The Germans claimed victory, leaving 81 Allied troops killed, 424 wounded, and 130 captured. Seicheprey sustained the heaviest losses in the Saint-Mihiel sector. Stubby got his first war wound at Seicheprey, when a German shell fragment lodged in his left foreleg. Stubby in Beaumont, France, 1919. Stubby later took part in the brutal offensives of Saint-Mihiel, Aisne-Marne, and the Champagne-Marne. When the war ended on Nov. 11, 1918, Stubby was in Meuse-Argonne. The process of demobilization was protracted, and troops stayed on for several months after Armistice. While waiting out the trip home from France, Stubby met his first of three presidents, Woodrow Wilson, on Christmas Day 1918 in Mandres en Bassigny. 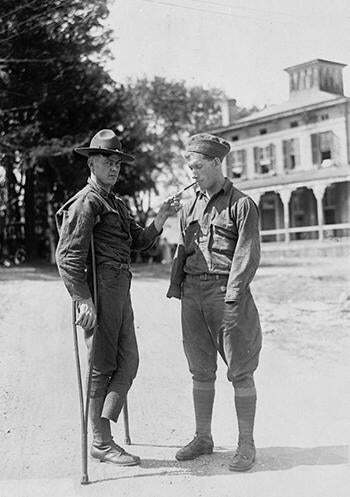 According to Bausum, the two reportedly shook “hands.” Four months later, on April 29, 1919, Stubby and Conroy were demobilized at Camp Devens, Massachusetts. After the war, Stubby was ubiquitous. He attended the 1920 Republican National Convention, which culminated in the nomination of Warren G. Harding. Harding officially received Stubby at the White House in 1921; in 1924, the dog passed review for Harding’s successor, Calvin Coolidge, three times. 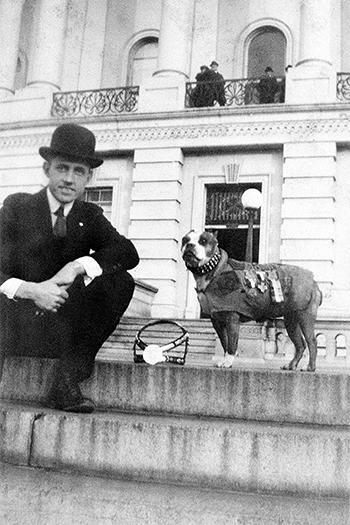 When Conroy went to study law at Georgetown, Stubby became the university’s official mascot, a predecessor to the Hoya bulldog of the present day. Usually closed doors were flung open for Stubby. In December 1922, the New York Times reported that for the first time, the exclusive Hotel Majestic on Central Park had broken its own rules and allowed the dog to stay overnight. Stubby was made a member of the Red Cross and the American Legion. The YMCA conferred a lifetime membership on the dog, stipulating that he was entitled to “three bones a day and a place to sleep” for as long as he lived. 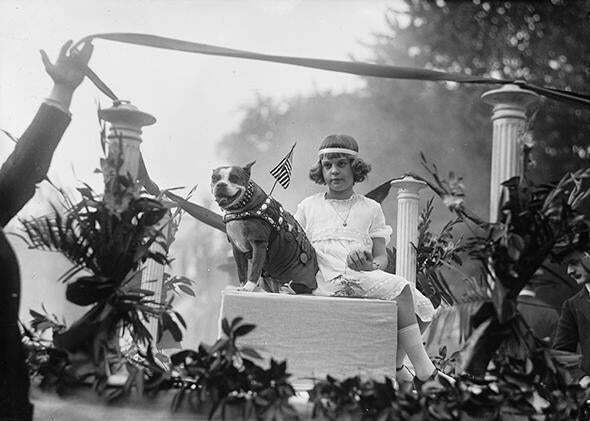 Miss Louise Johnson and Sergeant Stubby in a parade, May 1921. In the division of armed forces history at the Smithsonian National Museum of America History in Washington, there is a fascinating artifact, a testament to Stubby’s fame and the swath he cut across American popular culture in the immediate postwar years. It is a leather-bound scrapbook, kept by Conroy. The book is crammed with documents and ephemera: fan letters, poems, drawings, an invitation to the White House from President Wilson. And there are newspaper clippings, the closest we have to a comprehensive anthology of the press coverage of Stubby. The accounts collected in Conroy’s scrapbook broadly sketch the narrative of Stubby’s service that became familiar in the immediate postwar years. Over the top he went with the boys on many occasions, and the sight of the enemy was like a red flag to a bull. On one trip “over” he sank his teeth in the seat of a fleeing Hun’s trousers and did not let go. “Kamerad,” howled the Hun; but Stubby paid no attention, hanging on until the foe laid down and gave up to the Yanks. We can feel confident about certain details that emerge from the journalistic record: Stubby served in France, he was the beloved mascot for the 102nd, he was wounded at Seicheprey. There are sepia-toned photographs showing the dog in the French countryside, surrounded by soldiers on a wooden Ford Model T ambulance. 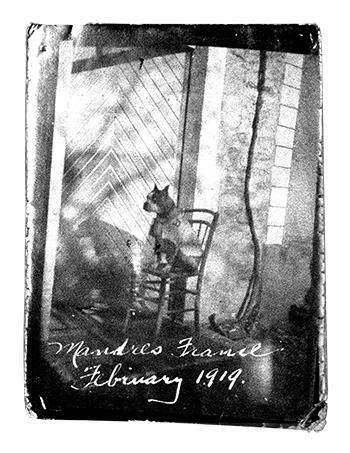 Another photo, dated February 1919, captures Stubby in the town of Mandres-aux-Quatre-Tours, in Lorraine in northeastern France. The dog sits in dappled sunlight, in a reflective pose on a wooden chair against a brick wall backdrop. But given the documentation that has survived, it is difficult at times to separate the actions of the real dog from the mythology that sprung up around him upon his triumphant return with the victorious American Army. But the very fact of Stubby’s celebrity itself enlightens our understanding of the war and its aftermath. Surely some measure of his popularity in the postwar period was due to the novelty of a canine hero. But the dog was also the perfect mascot for a war that had introduced human carnage on a scale never previously seen. While Stubby was hailed with newspaper encomiums and ceremonial pomp, something was being glossed over: the grim details of life in the trenches, poison gas attacks, debilitating war injuries, death. At Walter Reed Hospital in Washington, a soldier who is missing a foot lights a cigarette for a soldier who is missing both arms, circa 1918. It is a truism that World War I was the first modern war, but it’s easy to forget what that meant 100 years ago. The scale and nature of World War I was unprecedented, shocking even to Americans who had lived through the Civil War a half-century earlier. 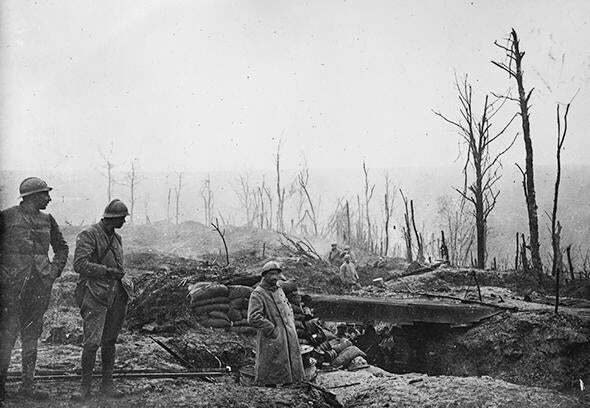 Many veterans were haunted by their experiences in the trenches, but American and military culture did not encourage the airing of battlefield traumas. Shellshock was regarded as a mental illness, the result of cowardice, a shameful disease. In this environment, Sergeant Stubby was an ideal World War I hero, because he was ideally stoic. He was the jaunty little creature who could be trotted out for parades, appear with politicians and military brass in photo opportunities, and was guaranteed to stay on message. J. Robert Conroy and Sergeant Stubby at the capitol in Washington. It’s impossible to say if Stubby’s celebrity was cultivated by the U.S. government or if it was the result of an organic groundswell. While there is very little written record about Stubby’s keeper, J. Robert Conroy, we do know that from 1913 on, his life was very much intertwined with the U.S. government. After the war, he worked as a bureaucrat, first for the Bureau of Investigation (predecessor to the FBI) at the Justice Department, then with military intelligence and finally on Capitol Hill as secretary for a Connecticut congressman. Still, not everyone was captive to Stubby’s charms. The most revealing page in the Stubby scrapbook may be the one in which we find a note, inscribed in Conroy’s handwriting: “Criticism of Stubby which proves he is famous.” It is a single page, but its contents show that Stubby-mania wasn’t embraced by all Army veterans. And much of the criticism illustrates that commemorating Stubby did often mean neglecting the story of human veterans. If this Boston bull did so much and the boys didn’t do anything, why not send an army of bull pups the next time and see who is entitled to these honors? I think the whole thing is nothing but a disgrace to the U.S. Army. I feel that I am insulted … the thousands of real heroes, the red-blooded American boys who left gallons of their blood and maybe an arm or a leg on the battlefields don’t get these honors bestowed on them. They didn’t do anything to receive a medal or the name “a real hero.” But a dog did. Stubby died in his sleep in Conroy’s arms in 1926. Today, he may be the last decorated World War I veteran that you can still see in the flesh. His taxidermied remains are on view at the Smithsonian, in a crowded display case alongside a mannequin doughboy and another World War I military animal celebrity, the carrier pigeon Cher Ami. Stubby’s ears are pointed up, and he wears a gruff expression. He looks like a ramrod sergeant: tough, unsmiling, no nonsense, with a coat covered in medals. Sergeant Stubby at the Smithsonian Institution National Museum of American History. Correction, May 8, 2014: This article originally misspelled author Ann Bausum’s first name.